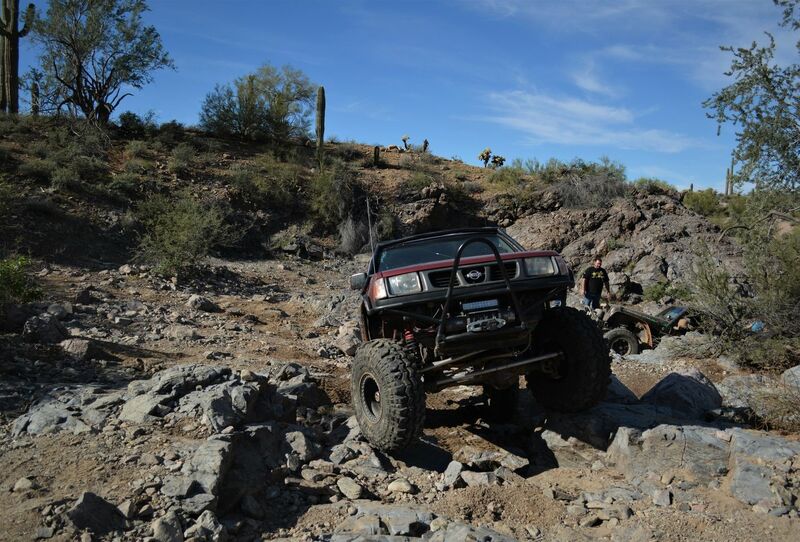 The ohv region near Florence Arizona is loaded with incredible off-road trails for all types of vehicles. One particular trail, Elvis, is becoming widely known for its numerous rock waterfalls that will challenge even well built rigs. Legion has it the trails name comes from a local miner’s dog that traveled along the route with him many years ago. The terrain along this route is harsh, the rocks are sharp and everything out there wants to poke or sting you. The trail begins as a simple sand and rocky wash before depositing you in front of the first waterfall. This is where most the carnage seems to happen, there are numerous optional lines over the large boulders and there’s quite a few large boulders to contend with. A spotter will help, your vehicle should have skid protection and a locker is recommended. 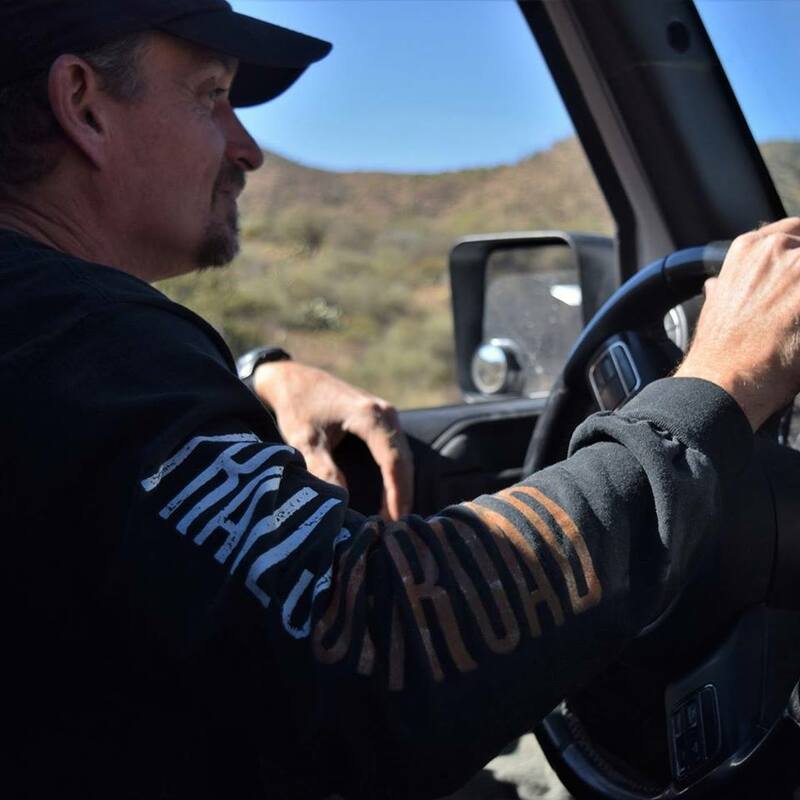 There are numerous large boulders along the route that will require an experienced driver with a reliable vehicle to successfully navigate the entire trail. Rocky or undulated road surface. Rocks less than 84" tall and/or vertical ledges less than 72" tall and/or near vertical ledges or waterfalls less than 14' foot. Tire placement not good. Can be steep and off-camber. Elvis can be a challenging trail for even modified vehicles. But with an experienced driver, the trail can be completed by slightly modified and even some stock vehicles. The trail was not meant to have by-passes for any of the waterfall obstacles, please consider this when you attempt this trail. 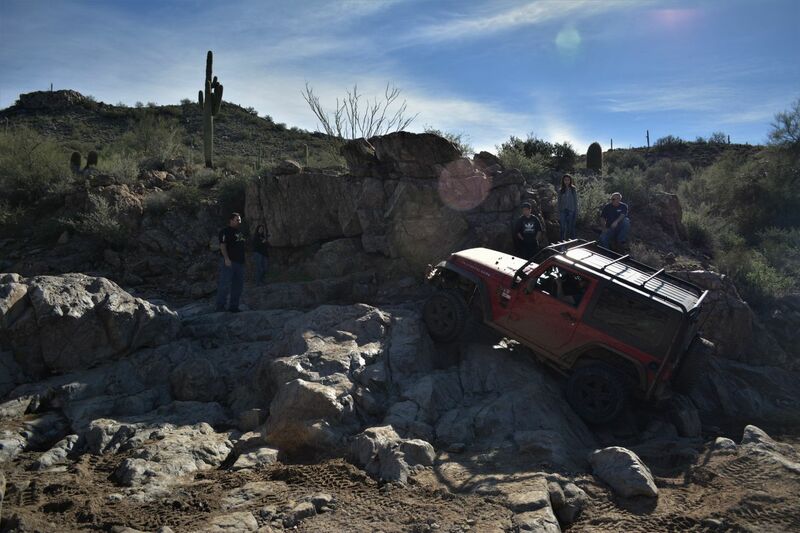 Sandman Road parallels the entire route and is a viable alternative to this "rock crawling" trail. The beginning of Elvis is an easy sand and rocky wash but nothing difficult for quite a while. The first waterfall is the most difficult along the route. It has numerous large rock obstacles and 2'-3' vertical ledges to contend with. A spotter is highly recommended for all the rock sections from this point forward. Each section of waterfalls has a different line to travel, each with its own challenges. Waterfall 4 has an optional up and over type climb that is the trails stand out obstacle. Not all the obstacles have been noted on this write-up, there are a couple very difficult ones that will be obvious to the drivers and vehicles capable of them. 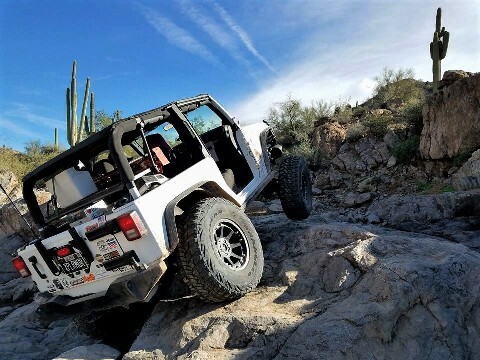 Rock crawling trail for experienced drivers. No by-passes should be used and please do not rock stack the obstacles. The by-pass is Sandman Road. Once you enter the sandy wash next to the cattle corral, way-point 11 of Sandman Road, turn left, traveling north in the wash, keeping the corral on your left. After quite a long distance in the sandy and bumpy wash, you encounter the first waterfall and the one that causes the most carnage. There are numerous ways through this section but starting on the right over the ledges and zigzagging up is the easiest way through. there are several optional difficult obstacles here, many challenges to choose from but please respect the delicate desert vegetation. A spotter is recommended and there is no recommended bypasses from here forward. The second rock section has three or more ways through. The left against the large rock is the least difficult. The 3rd waterfall section also has numerous ways through. Each of this is very different for each vehicle type. All the way to the right can often be the easiest way through. Please keep in mind, the by-passes and not considered part of the trail. 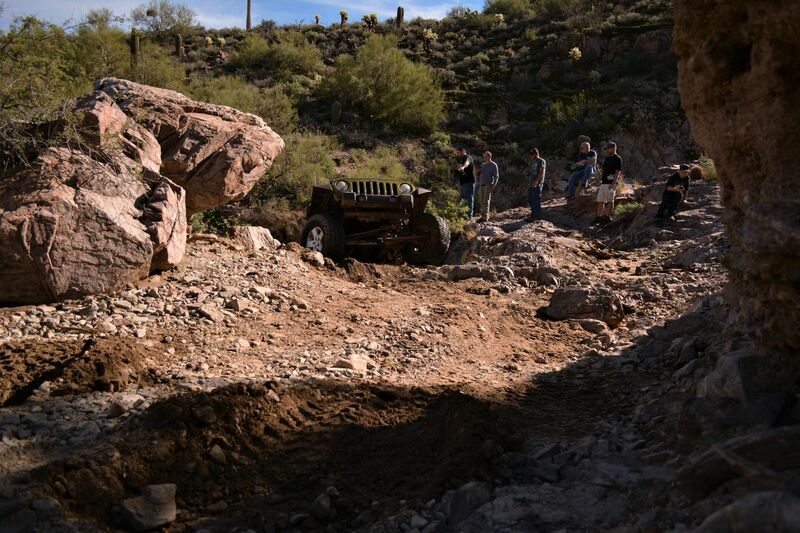 The boulders can be a tough section for long low vehicles. The loose sand and large solid boulders cause many hang-ups. On the right side at the turn there is an optional rock obstacle for modified vehicles. The squeeze and 4th waterfall are by far the most popular along the trail. Most everyone has too go through the squeeze on the left while modified vehicles can attempt the up and over climb on the right. The backside of the climb should be looked at before attempting. Once you traverse one of those two, you then have to either climb the waterfall on the left or the easier rock section on the right. Once through this section, continue in the wash. The last waterfall is the smallest of them but it can change with the next storm. Through the middle is the easiest while to the far right there is a more difficult climb. The trail ends once you pass through the cattle gate, please always keep it closed. You encounter Sandman Road where you can go left back to the beginning or to the right will lead you to the beautiful Box Canyon. From Highway 79 near Florence - take Price Road East into the desert to Sandman Road. It's about 7.5 miles from Highway 79. Turn left onto Sandman Road, and enter Elvis at the cattle corral, way-point 2 on Sandman. The trail runs parallel to Sandman Road - in the wash, just east of Sandman Road. The area has numerous primitive campsites and staging areas but nothing along Elvis. They can be found along Price Road on the way to the trailhead. There are no services or facilities in the area for campers. There is no running water in the area for campers. Please be aware of no burn periods throughout the year and always remember to completely extinguish your fire when leaving. Please note that a permit is often required in this area (when on State Trust Land). It is highly recommended to purchase a permit to ensure there is no confusion if a ranger stops by camp. 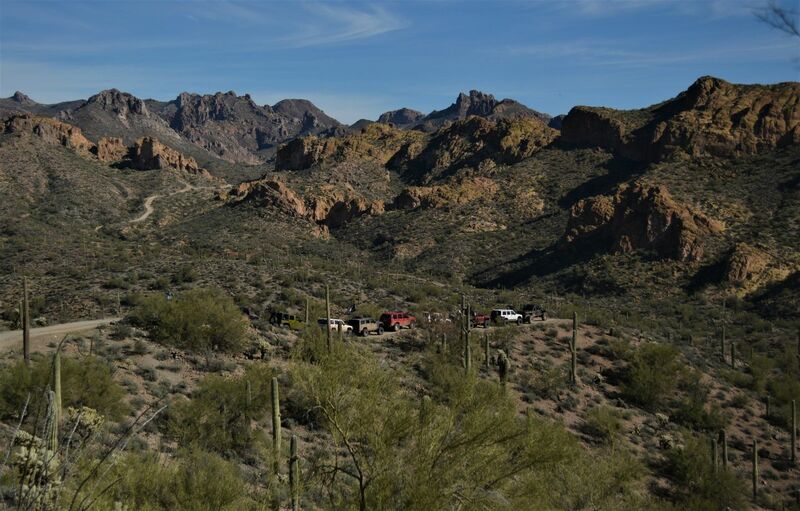 Dispersed camping is allowed on Public Lands in Arizona for no more than a period of 14 days within any period of 28 consecutive days. The small town of Florence Arizona, offers a couple independent motels as well as having a Holiday Inn Express. Apache Junction and Mesa, AZ are roughly 40 miles away and offer all the amenities needed. This will always be one of my favorites. The trail has enough challenges to keep me coming back and trying a little different line. Unfortunately the trail is getting over stacked with rocks. If you cannot make an obstacle, hook up a winch or turn around. Do not alter the trail for the next person and if you do remove the rocks when you're done. Do not create bypasses. This is ruining our ROCK CRAWLING trails. 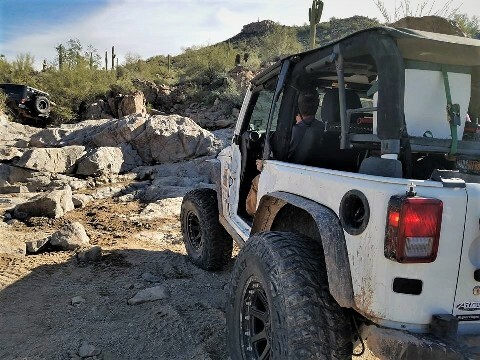 A stock CJ, a slightly modified TJ and a slightly modified JK go out into the desert. Which one.... We had a great time on Elvis. We hit the trail late; but @ 9AM; the temp's were still reasonable. The CJ attempted the center of the 1st waterfall but backed off with clearance concerns for his rear dif. (no lift & 30" tires). We all opted to start at the right and head up the center after cutting left atop the 1st ledge. The rest of the trail (we completed) is fairly simple if you have a slight lift, sway bar disconnect and 32's or better. I had a couple of bad line choices and smacked my sway bar on the passenger side and my rear dif. once each. I put the 1st dent on my rig at the Squeeze. Luckily it was on my passenger side rock slider. After watching Bobby's video I realize it could have been avoided by being further right (pay attention to Bobby's video's before heading out). I was centered up going in and when the front wheel's came down neither of my rear wheels had started the climb. The middle of my JK came down to meet rock (4" lift and 35" tires). We were unable to complete the trail due to the TJ realizing that he had a crack in the one of the weld's on his front 4 point after waterfall #3. We babied it out until we could get off onto Sandman (after the squeeze and waterfall #4) to drive back to the trail head. He had some unexplained squeaking headed in, so I do not believe this trail caused the issue. Have fun & as always if you wheel in the desert during the summer months take plenty of water. This one of my favorite trails for my Polaris General. It is quite challenging but loads of fun. This is mostly run with Jeeps but my friends and I have run it many times in our UTVs. We accomplished all the obstacles and never used a bypass. My General has a 3" lift and slightly larger tires than stock. I have also removed the front sway bar. We went out as a group of 11 vehicles to conquer this trail. A few of us have ran it several times but it was new to a few people, meaning we had to assist them through some of the tougher sections. The first waterfall feature had a very large boulder in the hole of the notch which made it much easier. We did not have time to remove it and it will likely have to be winched out. The rock stack really takes away from a very popular rock crawling obstacle. There appears to be a parts collection memorial of sorts above the first waterfall on the left. This reminded me of the beginning of Highway To Hell. The rest of the trail was great as always and we all made it out on our own power, which is another great day on the trail.